Amazon has the Minecraft Diamond Edition Steve 6 Inch Vinyl Figure for only $22.99 (reg. $49.95)! This is a great gift for any Minecraft fan and is apparently hard to find. Plus it is eligible for FREE shipping on orders over $25. 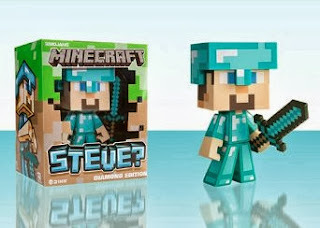 Minecraft Diamond Steve Vinyl 6" Diamond Edition Figure. LIMITED EDITION DIAMOND EDITION STEVE VINYL FIGURE. OFFCIAL PRODUCT FROM MOJANG. DIAMOND STEVE COMES PACKED IN ITS OWN DIAMOND EDITION COLLECTORS BOX. VERY HARD TO FIND AND SOLD-OUT AT MOST STORES. THIS IS A MUST HAVE FOR ANY MINECRAFT FAN AND MAKES A GREAT GIFT FOR ALL MINECRAFT LOVERS.